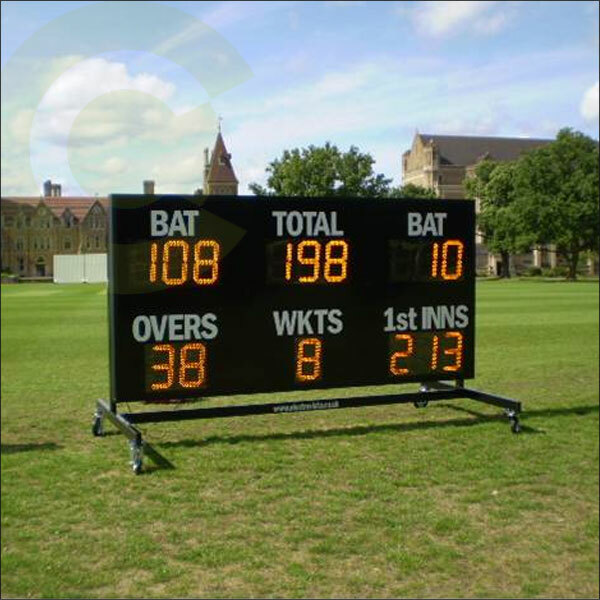 Large Sized Mobile Electronic Cricket Scoreboard - CRA Cricket UK. High visability large format club specification match digital mobile cricket scoreboard. Large display electronic numbers offer a clear record of the scores, controlled remotely. 320mm high visibilty characters. Wall fixed, in ground posts or optional mobile trolley. Shown with optional steel wheeled trolley with castors large enough for grass use. Standard 240v power lead. Robust schools / club grade manufacture. Numbers: 320mm high x 250mm. Overall width 3000cm. Overall height: 1500cm.